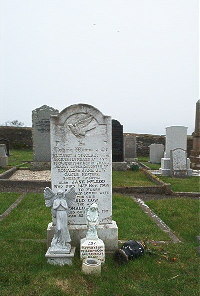 Elizabeth Sinclair Gow accidentally killed at Clyth 15th June 1942 aged 5. Dearly loved daughter of Donald and Jane Gow Castle Heather Smerlie Lybster. Mother Jane McLeod died 14th November 1985 aged 70. Very dearly loved wife of the said Donald Gow. Father Donald Gow died 30th April 1991 aged 82.